The Children’s Leukaemia & Cancer Research Foundation (Inc) supports Associate Professor Ursula Kees, our Principal Research Fellow, Ms Jette Ford, Research Officer, a Laboratory Assistant, provides financial assistance to a Ph.D. Scholarship, laboratory consumables, maintenance and equipment for the Research Laboratory. Without this support the laboratory could not continue its life-saving research. To provide our research team with some degree of security, the Foundation operates on a three year block grant funding process. The research work that has been completed and the work proposed for the next three years is assessed by an international group of eminent scientists and only subject to a satisfactory assessment does the Foundation continue to fund the research. The Research Laboratory is housed in the Telethon Kids Institute and the Administration Office of the Foundation is situated at Suite 3/100 Hay Street, Subiaco. It should be noted that the Foundation is a separate legal and financial entity from that of the institute and the hospital. The Foundation has a commitment to ensure this ground-breaking research continues for the sake of all children who suffer from these diseases. 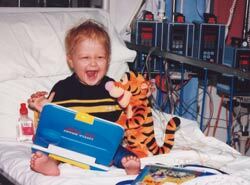 When the Research Laboratory was first established in 1983 – seven out of ten children diagnosed with leukaemia DIED. In 1998 – eight out of ten children are now CURED and go on to lead normal lives.